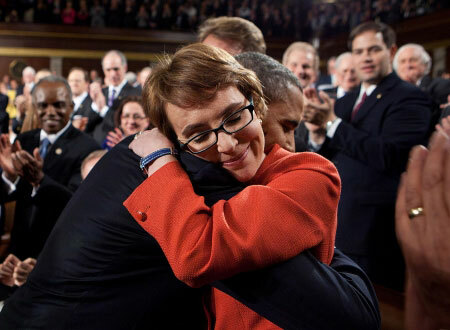 2011 – JAN 10 – The nation paused for a moment of silence this morning in honor of the victims of the Arizona mass shooting that killed six people and left U.S. Rep. Gabrielle Giffords in critical condition with a gunshot through the head. Among the observances, hundreds of people lined up outside the U.S. Capitol for the silent tribute set by President Barack Obama. Mark Kelly issued his first statement late Sunday, a day after Giffords was shot in the head while meeting with constituents outside a Tucson, Ariz., supermarket. Six people were killed and 14 were wounded. The lone suspect, Jared Loughner, is scheduled to appear in federal court in Phoenix today. Kelly, 46, made no mention of his wife’s medical condition, but doctors have said they are “cautiously optimistic” Giffords will survive. The 40-year-old three-term Democrat, who was shot in the head, remains in critical condition in a medical coma and on a ventilator. Doctors say she has responded to simple commands. In April, Kelly is slated to command what’s expected to be the last space shuttle flight, before the entire fleet retires. But it’s too soon to tell whether he’ll back out of the high-profile Endeavour mission to stay at his wife’s bedside. His identical twin, Scott, is also an astronaut, currently following news of his family’s crisis from thousands of miles up in space, aboard the International Space Station. “I want to thank everyone for their thoughts and prayers, words of condolences and encouragement for the victims and their families of this horrific event,” Scott Kelly wrote on Twitter from space. This isn’t the first time family tragedy has touched the International Space Station. At Christmas 2007, astronaut Daniel Tani was aboard the orbiter when he learned of his mother’s death in a car-train collision. Tani has been working at Mission Control in Houston this past week and has been in touch with Scott Kelly and other members of the space station crew, The Associated Press reported. Loughner, 22, was charged Sunday with one count of attempted assassination of a member of Congress, two counts of killing an employee of the federal government and two counts of attempting to kill a federal employee. More charges are expected as well. Among those killed Saturday were a federal judge, a congressional aide and a 9-year-old girl. A high-profile public defender, Judy Clarke, has been appointed to represent Loughner. Clarke previously defended “Unabomber” Ted Kaczynski and assisted in the case of confessed al-Qaida operative Zacarias Moussaoui. Friends and acquaintances described Loughner as a pot-smoking loner who lived with his parents and was kicked out of community college recently. College classmates and teachers said he was apt to burst out laughing hysterically at inappropriate times and made bizarre comments that seemed disjointed and out of context. Saturday isn’t believed to be the first time the suspect had contact with Giffords. When authorities searched his parents’ home, they discovered a letter locked in a safe there, believed to be a form letter Giffords sent constituents as a thank-you for attending another meet-and-greet event in 2007. “Also recovered in the safe was an envelope with handwriting on the envelope stating, ‘I planned ahead’ and ‘my assassination’ and the name ‘Giffords,’ along with what appears to be Loughner’s signature,” authorities said.